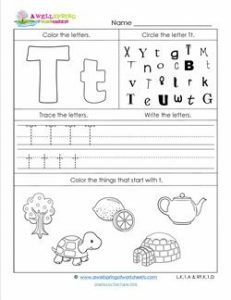 Of all the abc worksheets, I can safely say that this one for the letter T is totally terrific! It has big bubble letters for kids to color in, uppercase and lower case letters to find (one of each in each row), Nice writing lines with dashed lines in the middle to help write the T’s neatly, and five objects, three of which start with the letter t. Lots of learning, reinforcement and coloring fun. Kids can help each other or work alone to complete this worksheet.